Summer Reading List for Biomimics! We asked leaders in the biomimicry community – including Biomimicry Institute staff, founders of the Biomimicry Global Networks, our friends at Biomimicry 3.8, and our co-founder, Janine Benyus – for their summer reading recommendations, and have compiled a great list of books for your trip to the beach (or lake, reservoir, bay, pond, channel, estuary, fjord, bight, canal, wetland, lagoon, marsh, tributary, or river delta) this summer. Some may be better suited for hunkering down during winter months, but all will provide a new perspective in thinking about sustainability, innovation and design, and our relationship with the natural world. Enjoy! Global Biomimicry Design Challenge Launches Today! How can nature inspire us to design a better, healthier food system? The Biomimicry Institute and the Ray C. Anderson Foundation are inviting professionals and students from across the world to participate in a Biomimicry Global Design Challenge. 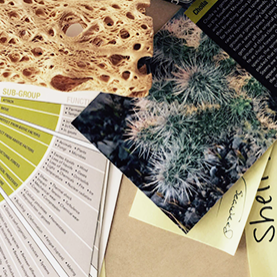 Using biomimicry as a tool, participants are invited to tap into nature-inspired solutions to help solve key food and agriculture issues like food waste, food packaging, agricultural pest management, food distribution, energy use, and more. Participants may be featured in high profile media and will have access to biomimicry experts, mentors, and valuable resources. Teams will be competing for cash prizes totaling $160,000, including the Ray C. Anderson Foundation $100,000 “Ray of Hope” Prize. Many thanks to Louie Schwartzberg and his team at Moving Art, who generously donated their time and gorgeous cinematography for this video. Info and video courtesy of The Biomimicry Institute. In response to growing coastal challenges, including habitat degradation, loss of biodiversity, and climate change, efforts around the country and the world are increasingly embracing strategies and initiatives focused on promoting environmental sustainability and social responsibility. The most significant impediment to sustaining our coastal natural and human built systems, and the goods and services they provide, is not a lack of technical knowledge but the need for all stakeholders to understand whole systems-level intricacies that true conservation, restoration and adaptation work requires. Eastern oysters clean up to 50 gallons of water per day. My work is based on a biomimicry approach in addressing coastal issues. Natural coastal systems and local keystone species like oysters, and habitats such as shellfish beds, salt marshes and eelgrasses work together to stabilize our coasts, sediments, filter water of nutrients and pollutants, providing conditions conducive to life, which are resilient and adaptive to environmental changes. Observing and learning from coastal systems leads naturally into a discussion on how to apply this wisdom in our human built environment. I’m looking forward to teaching and working with designers, engineers, architects and social entrepreneurs in this region, and excited to see what innovative ideas our teams produce. If you’re interested in joining our Design Charette on November 17, 2014, please visit this page for more information. If you are interested in being a Community Partner or Event Sponsor, please contact Adiel Gavish adiel@biomimicrynyc.com. She and Vandana Shiva both discussed the embedded wisdom found in the soil and seeds of corn and rice and how that wisdom is lost through genetic manipulation. Seeds that have undergone genetic engineering are deprived the ability to evolve, and therefore become resilent in conjunction with the ecosystem of which it is an integral part. Vandana explained that “seed freedom is the freedom of seeds to evolve.” That without evolution, no seed can become resilient to changing environmental conditions. And that when you work with evolution, you protect diversity. She encouraged farmers to work towards embedding health per acre, as opposed to other shorter term economic goals. Both speakers were awe inspiring, as they shared their stories of perseverance and grassroots advocacy. We encourage you to visit the Omega website and listen to their stories (video link to come). Women leading change in these dynamic times are tuning into new sources of inspiration—personally, socially, and globally. They are seeking guidance in how to be more adaptive, resilient, networked, and systemic—all things we can learn from the natural world around us. BiomimicryNYC board member and Biomimicry Chemist Mark Dorfman, as well as Founding Member and architect Janus Welton will speak to emerging design professionals at the ASID (American Association of Interior Designers) event this September.